Ethanolamines Market size was USD 2.79 billion in 2015, and is anticipated to grow at a CAGR of 4.1% between 2016 and 2024. Rising demand from agrochemical and surfactants, strong infrastructure growth in Asia Pacific and substantially potential demand from natural gas processing are likely to spur global ethanolamines market size. Relatively slower rise of raw material costs and other factors are also expected to contribute to revenue gain. Demand from other applications such as paints & coatings, cosmetics, textiles, additives, among others, is also likely to help the global industry grow in coming years. Ever-rising integration in the value chain, along with a fragmented industry moving towards consolidation within a few key players, is likely to increase competition. Major challenges faced by the global ethanolamines market include stringent regulations and health concerns raised by the ill-effect of these chemicals on human well-being. For example, The European Commission had banned the DEA use in cosmetics to reduce contamination from carcinogenic nitrosamines. Medical studies have been conducted to test the effect of this chemical on human liver and links have been found to liver tumors in the past decade. This limits the usage of these chemicals in a wide range of applications and suitable substitutes have found a path to enter the market at the same time. Despite various challenges, the diethanolamines market size is likely to be the most attractive product segment globally, with revenue of more than USD 1 billion in 2015, with growth forecast of more than 4% between 2016 and 2024. Triethanolamines was the largest product segment in 2015 and is expected to grow with a favorable CAGR over the duration of the forecast period due to the wide range of applications it caters to. DEA is likely to surpass the TEA market in terms of both volume and revenue by 2024. Surfactant applications led the ethanolamine market share and accounted for over 25% of the global revenue in 2015. Chemical intermediates and herbicides accounted for over 40% of the ethanolamines market size with moderate gains forecast by 2024. Growing agrochemicals industry arising due to a growing demand from agricultural activities and demand from various cleaning processes in numerous end-user industries are some of the reasons for these markets to exhibit the quickest growth numbers over the forecast period. 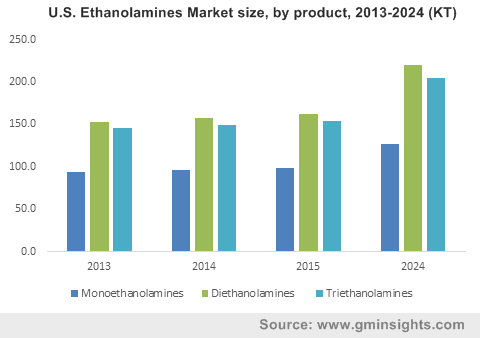 Although the current ethanolamines market exhibits overcapacity, various regions have been reported to show increased market growth in the near future with development and installation of new production plants. The Sadara Chemical manufacturing plant proposed in 2016 is one such example and is an outcome of a demand-supply gap existing in the region. DEA can attribute its growth to the herbicides market while the (MEA) monoethanolamines market is likely to grow due to strong demand for ethyleneamines and triazines. On the other hand, the demand for ester quats is expected to boost triethanolamines (TEA) revenue. The demand for MEA can be attributed to the rising demand for acid gases removal such as H2S from natural gas, olefins cracker products, and refinery streams. Asia Pacific, particularly, China and India ethanolamines market size, generated over USD 1 billion in revenues in 2015 and this region is likely to see strong growth based on domestic consumption. APAC and Middle East & Africa (MEA) are forecast to be the most favorable regions for the by 2024. Together, these regions have surpassed Europe, as the EU is likely to witness a dip in demand due to the European Commission ban on DEA in cosmetics. Cosmetics has been one of the leading application segments in the past decade and such a ban are likely to affect the ethanolamine industry in the long run. Europe ethanolamines market continues to explore alternates to substitute the growing demand for other applications. North America and Latin America are expected to display a favorable growth pattern in coming years. U.S. ethanolamines market which was over 400 kilo tons in 2015 presently accounts for over 84% of all North America revenue. Major industry players include The Dow Chemical Company, INEOS Group Ltd., SABIC, LyondellBasell Industries N.V., Huntsman Corporation, China Chemical & Petroleum Corporation, BASF-YPC Company Ltd., Sintez OKA LLC, among others. Global ethanolamines market share is moderately fragmented and the top 5 players accounted for approximately half the total demand in 2015. Current industry strategy seems to focus on product expansions and R&D activities in order to enhance and boost market demand in the near future. Key industry participants are looking to increase their capacities in order to tap the wide range of applications for ethanolamines. Numerous private players in China and India are also likely to show a boost in revenue demand. Ethanolamine is a viscous and colorless liquid with an odor similar to ammonia. It is produced by reaction of ethylene oxide with aqueous ammonia, the reaction further produces DEA and TEA. Chemical properties offered are similar to combine properties of alcohols and amines making it desirable to find applications as surfactants, herbicides, cement, and chemical intermediates. Growing personal care product demand due to increasing consumer spending has driven industry growth over the forecast timeframe.